The most powerful story in the world is the one that says that economic growth is the solution to the world’s social and political problems. However, using today’s technology, that solution creates a greater problem, the destruction of the world’s ecosystem. That’s a point convincingly made by Yuval Harari in his book Sapiens; A Brief History of Humankind. The only time that the rapid rise in greenhouse gases slowed, he says, was during the 2008 recession which caused a slowdown in economic growth. Now that economic growth is greatly increasing greenhouse gases continue to increase. Not only do the wealthy economic elite want the growth to continue, but so do the masses of the world. When the billions of Chinese and Indians, for instance, reach lifestyle parity with Americans and Europeans, the ecosystem will collapse. Some believe that evolving technology caused this, but that new technology can also solve the problem. However, others think for that to happen political and economic leaders will have to cause it to happen. Will W.C. Bradley Return Manufacturing to Columbus? “I don’t foresee it anytime soon,” W.C. Bradley Company CEO Marc Olivie’ told members of the Rotary Club of Columbus. The question was raised during a question and answer session held after Olivie’ had spoken on the status of W.C. Bradley Company. The company, which had a very good year, is selling millions of grills, Zebco fishing reels, and Tiki outdoor torches. None is made in America. Zebco operates out of Tulsa and Tiki Torches out of the Milwaukee area. While those products are sold globally, the company’s real estate business focuses on the Columbus area. It has extensive holdings in downtown Columbus and Olivie’ says he finds the revitalization of downtown very exciting, that it is truly a plus for the area. Matt Swift, fellow Rotarian and President and COO of the W.C. Bradley Company Real Estate Division, said, “We would not have been able to attract this Belgian and his wife to Columbus if downtown and Columbus in general was not attractive to them.” This day and age a city has to have the arts, quality educational facilities and other attractions to entice talent, and that attracting talent is the name of the game in business. Olivie’ also pointed out how valuable Columbus State University is to the Columbus area. Cities with good universities attract management talent. CSU has already played a big role in revitalizing downtown with its transfer of its arts schools and is about to play an even larger one when it also moves its College of Education and Health Professions downtown. W.C. Bradley Company owns 25 buildings, which occupy about a million square feet, in downtown. Except for the condos sold at Eagle and Phenix Mill No. 3, it rents its downtown buildings to occupants, Swift said. The lyrics of a 1939 popular music hit said that “T’aint what you do, it’s the way how you do it” also apply to paying people for the work they do, according to a group of Harvard professors. A study they conducted showed that simply paying people more did not increase their productivity. The best results came when employees percieved the increase to be an unexpected gift with no strings attached. They felt they were being payed more simply because their employer chose to do it. They reciprocated by increasing productivity. You can read the Harvard Gazette story by going to this link. For some reason I am having a hard time deciding what subject I should entertain for a new post. I know there is plenty to talk about. For instance, I could weigh in on the sequester thing. Well, all right, I will. I’m sure there is plenty of waste in federal spending. Of course, just as one man’s trash is another man’s treasure, one politician’s waste is another one’s necessity. Perhaps the greatest waste in Congress is Congress. I guess another subject I could tackle would be Jon Stewart’s decision to take four months off to direct a movie about a journalist being imprisoned in Iran. The Daily Show is something I enjoy daily and I’m sure will still enjoy it while he is gone. John Oliver will probably do a fine job as fill-in host. I’ve always wondered why they didn’t just substitute a host when Jon was on vacation, especially since he was on vacation so often. Then there’s the weather to talk about, and the networks have really been talking about it a lot. So, it’s snowing in D.C., so it’s always snowing in D.C. where we get snow jobs year round. You really want to get some idea of what’s going on in our nation’s capital? Go to C-SPAN. There you get it unfiltered, instead of what some news editor decides you should get. It’s sort of like reading the Bible yourself and not just getting it interpreted by some cleric. In both cases, some of it will astound you. Betsy Covington really grabbed my attention when she told Columbus Rotarians that the Community Foundation of the Chattahoochee Valley now has assets of $95 million. The Foundation can distribute the interest that is generated by that endowment to non-profit organizations that need it. The 200 funds that contributed that money can designate who gets it, but, as Betsy told me after her Rotary talk, the Foundation itself is given authority to decide who gets some of it. Columbus’ greatest problem is poverty. That was determined by a study a few years ago by the University of Georgia’s Carl Vinson Institute. Former Muscogee County Schools Superintendent Guy Sims tells me that the problem has gotten worse, not better. Guy, the original and unpaid Director of the Building Prosperity Initiative, which was organized to coordinate efforts to lessen the poverty problem in Columbus, says that program was put on hold three years ago after the 2008 Great Recession hit because charitable giving dried up. 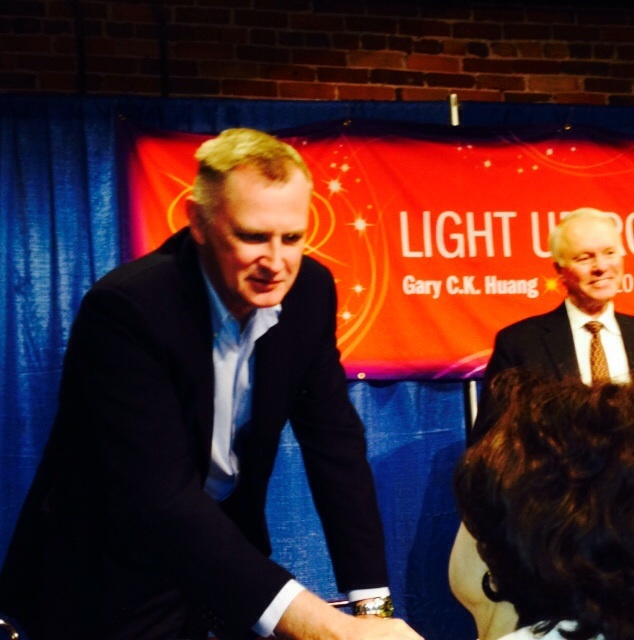 It appears that now givers are feeling confident enough to start giving again. Guy Sims said the Building Prosperity Initiative now has an office in the state’s Enrichment Services building. To get things going again, he says, money has to be raised to hire an executive director. He donated his services to get the program started, but a salary will be necessary for a permanent director. No, he tells me, he is not a candidate for the job, but he is still supporting the program. The catastrophic hurricane that devastated the northeast coast of the United States has revived the global warming debate. With all of the evidence that scientists have given us, it is incredible to me that at least 30 percent of the population are still in denial about it. A recent Yale study says 70 percent now accept that the planet is warming. A Gallup Poll taken in March of this year shows that 52 percent believe we are already feeling the effects. 29 percent think we will feel the effects in the future. 15 percent don’t think it will ever happen. Why did so many people disbelieve it before? One explanation is that a deliberate misinformation campaign was financed by industrial polluters who value profits over human safety. Hardly anyone agrees that one hurricane does global warming make. However, when all of the global warming factors are considered, the evidence is clear. There is global warming. Okay, some say, there is, but, it’s natural and not caused by industrial pollution. The vast majority of scientists don’t buy that. The do believe that industrial polluters play a significant role in exacerbating the problem. The polluters also have to breath earth’s air, so we have to wonder why some are still in denial. There is still a chance, perhaps a small one, but a chance nevertheless, to block the billboard industry’s attempt to clear-cut taxpayer owned trees on the state’s highways. It will take a veto by Governor Deal. Former state representative and retired Columbus lawyer Milton Jones, who is an enthusiastic Trees Columbus booster, states the problem and the solution. House Bill 179 allows billboard companies to clear-cut every single tree in a view zone in front of a billboard. Thanks to powerful billboard interests, HB 179 passed the Georgia General Assembly despite significant public opposition. Billboard owners can already trim and cut trees in front of billboards under existing law, but HB 179 would cut down every single hardwood and pine tree in a 250 foot view zone in front of billboards. These are trees owned by the public that would be sacrificed for private gain. HB 179 harms the scenic beauty of Georgia. Urge Governor Deal to stand up for trees and veto House Bill 179. You can email the governor by clicking here. Has the Time Come to End the Columbus Property Tax Freeze? PETE ROBINSON SAYS IT HAS. Attorney, lobbyist, and former Columbus state legislator Pete Robinson ran the end-the-property-tax- freeze flag up the political flagpole again. Now, we’ll get to see how many Columbus citizens salute it this time. Twice before freeze-enders got shot down in referendums, and the freeze was upheld in a state supreme court ruling. Times are different now, Robinson told Columbus Rotarians today. A lot of people who work and use Columbus public services don’t own property in Columbus any more. Columbus basically depends on property taxes to pay for government services, and since counties that don’t have tax freezes, such as Harris in Georgia, and Russell is Alabama, are more attractive to people who buy new homes, the tax digest in Columbus simply isn’t going to be enough to finance the Columbus-Muscogee County government. In order to tax those people who live in other counties, but work in Columbus and use Columbus infrastructure, there has to be a change. One is is to depend more on sales taxes – he called it “consumption” taxes – and another is to institute a Columbus income tax. And ending the freeze will also encoruage more people to buy homes in Columbus. Sales taxes, the most regressive because lower-income people pay a higher percentage of their income than upper-income people, are already high enough in my book. I’d lean more toward an income tax. Also, I have never thought the property tax freeze was a good idea. When a new homeowner moves in and has to pay $2,000 in property taxes and his or her neighbor, who has been living for 20 years in the house next door that is of the same value, pays $100, you know something is wrong. I asked Robinson if he really thought there was a chance in hell the tax freeze would end. “It has to!” he said emphatically. I’m sure our new mayor Teresa Tomlinson will be very interested in seeing how Columbus citizens react to Robinson’s position. It is incredible that our country is in very costly wars – costly in many ways – but most Americans appear not to be thinking about it. It is probably thought about more in our area, Columbus (Georgia not Ohio), because Fort Benning supplies so many troops to the war zones of Afghanistan and Iraq. I just checked the top 10 searches on Yahoo in 2010. The BP Oil Spill tops the list, followed by the World Cup. Teen singer Justin Bieber and American Idol made the list. But neither Afghanistan nor Iraq are on it. 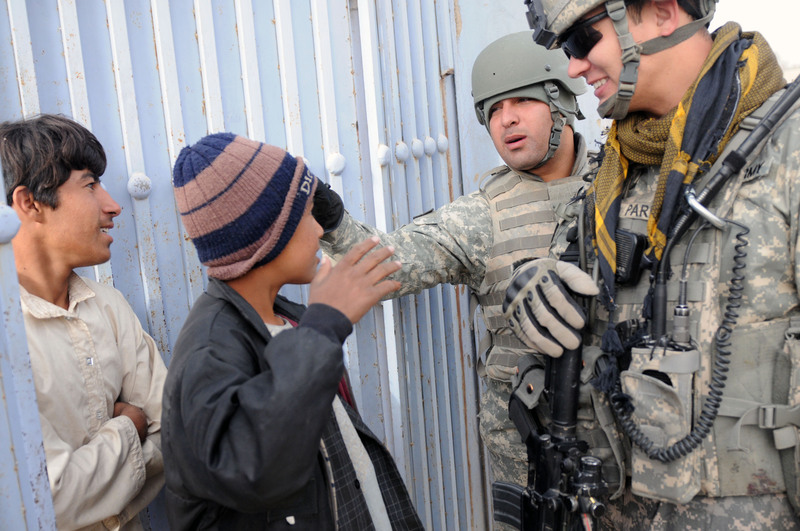 More than 4,400 Americans have been killed in the Iraqi war and more than 1300 in Afghanistan. About 34,000 have been seriously wounded. In 2001 the U.S. Defense budget was $316 billion. $13 billion of that went to the war in Afghanistan. This year, 2010, it’s $693 billion, according to Time, with $102 billion going to Afghanistan and $61 billion to Iraq. This is really serious business, but you don’t see much about it on TV nor in the newspaper. Even though I was just a child during World War II I vividly remember the constant coverage of the war. It was front page and led radio newscasts just about every day, and dominated the newsreels in the theaters every week. Just about every one had a friend or relative in the military. People were keenly interested in news about the war. Now, it seems to be something everyone just takes for granted. We have been at war so long that it has become the norm. It is a norm that is having tremendous consequences, consequences that not many of us seem to think about very much. MORE DELAYS IN COMPLETING THE CORPS OF ENGINEERS ENVIRONMENTAL IMPACT STUDY COULD COST GEORGIA BILLIONS OF DOLLARS AND MANY JOBS. THE STUDY HAS LASTED 14 YEARS AND COST $36 MILLION, AND IT’S STILL NOT READY. Ships continue to be the main source of transoceanic cargo delivery. That’s why the Port of Savannah is so important to the state, and even the Southeast region. I read that it is the second busiest port on the East Coast, the fourth busiest and fastest growing one in the country, but it has a big problem. Namely, the foot-dragging bureaucracy of the U.S. Army Corps of Engineers. The Savannah port just isn’t quite deep enough to handle the really big ships. Sometimes they use it anyway, but they can’t load them to capacity. In 2014 this will be a bigger problem. That’s when the Panama Canal’s expanded canal is expected to open. It will allow huge container ships in the Pacific to call on East Coast ports. The Savannah River is only 42 feet deep. The Georgia Ports Authority wants to deepen it by at least another 6 six to allow the larger ships to come calling. The big problem is the Corps of Engineers seemingly never-ending environmental study that, according to an editorial in the Savannah Morning News, has been going on for 14 years at a cost of more that 36-million dollars. This getting beyond absurd. The study was supposed to ne finished by 2007, but wasn’t. Now the corps is saying it will not be finished until 2011, if by then. It will take three years to deepen the channel. That means it is critical that the study is completed no later than 2011 because not to deepen the channel will mean the really big container ships will use East Cost ports that can serve them. That will be an huge economic loss to Savannah and Georgia. In my view, no thinking person would want to deepen the channel if it causes irreparable environmental damage. It is known that it will cause more salt water to flow upstream, which could have negative impact on the delicate estuary system. An estuary is where salt water and fresh water meet and mix. It is critically important to sea life. Channel deepening could also send salt water into the freshwater aquifer beneath the Savannah River. The study should answer those questions. Why, though, has it taken 14 years and 36 million dollars to come up with those answers? 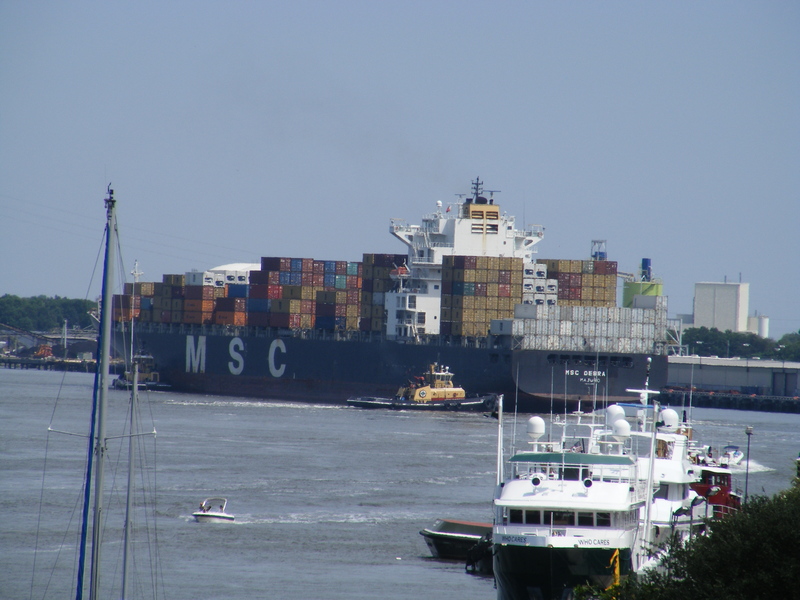 Massive container ship starting its 15-mile trip down the Savannah River from the Savannah Port to the Atlantic Ocean. This shot was taken from the balcony of the VU Lounge and Restaurant at the Hyatt in downtown Savannah.